A fire aboard a derailed freight train carrying crude oil and propane across the Canadian region of New Brunswick has caused 150 residents to be evacuated from their homes. Despite two of the cars being set on fire as a result of an unexpected derailment, no deaths or injuries were caused. Of the 17 cars that derailed last week [8 Jan], five contain crude oil and four contain liquefied petroleum gas, officials said. The train's brakes came on unexpectedly, Canada's Transportation Safety Board said based on preliminary information from the rail company and police. "Preliminary reports were that the train was proceeding, and while proceeding experienced what we call an undesired brake application," said Daniel Holbrook, a manager with the safety board. Holbrook also said the crew found a broken axle. 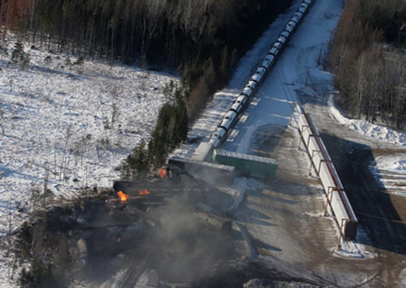 The derailment in a sparsely populated region, roughly 20 miles (32 kilometers) from the U.S. border and northern Maine, has raised concerns about the increasing use of rail to transport oil throughout North America. In July, 47 people were killed in Lac-Megantic, Quebec, when a train carrying crude oil derailed. A series of recent derailments in North America have worried both officials and residents close to rail lines. On Dec 30, an oil train derailed and exploded in North Dakota, causing the evacuation of a nearby town but no injuries. Between January and September of 2013, some 118,000 carloads were shipped via rail. In November, the federal government required rail companies to tell municipalities when they transport dangerous goods through their communities, after provinces and the Federation of Canadian Municipalities demanded more transparency.